Why hire a Rolls Royce Convertible? You’ll struggle to find another 1970s Rolls Royce convertible hire car in the UK that you can drive yourself, let alone one as beautiful as this. How many of us can claim to have ever been in the car that has become known as the ultimate prestige car in the world, let alone driven one? A classic Rolls Royce Corniche Convertible is rare. The height of luxury, this is a most magnificent car for your special day. Hire this Rolls Royce either for a wedding or for a very special occasion like an anniversary. Or any occasion where you want the perfect luxury classic car experience. What father would not relish the opportunity to drive his daughter to her wedding in this sumptuous limousine? Take the roof down to be seen by all your guests, and to get wonderful photo opportunities. 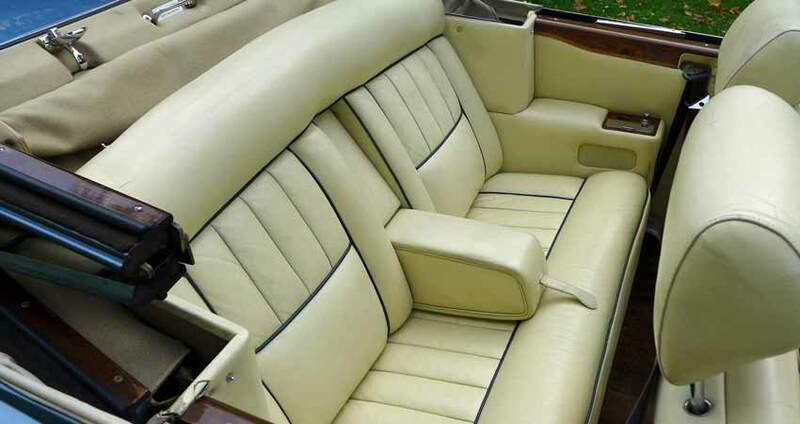 With its gorgeous styling and effortless performance, this 1976 Rolls Royce hire car certainly wouldn’t be out of place cruising through London’s most prestigious postcode areas. Hire this aristocratic motorcar and you’ll attract attention and feel like a multi-millionaire. It offers spacious, luxurious open topped motoring for up to five people. Slip behind the wheel of what may just be the most luxurious car you will ever have the pleasure to drive with a Rolls Royce hire in Yorkshire. 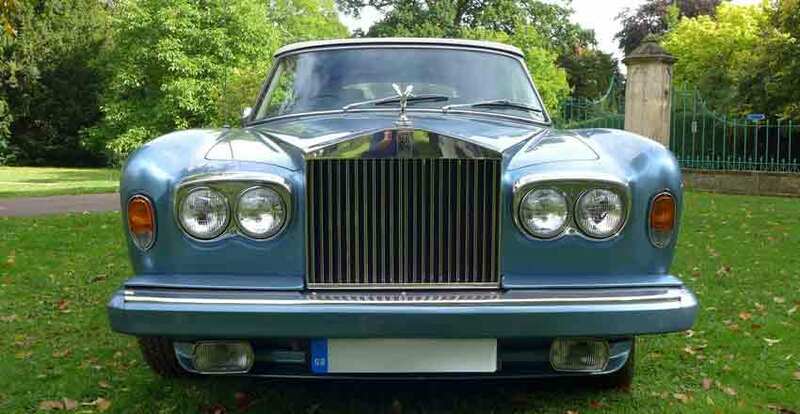 The Corniche was launched in 1971 as Rolls-Royce’s coupe version of the Silver Shadow. 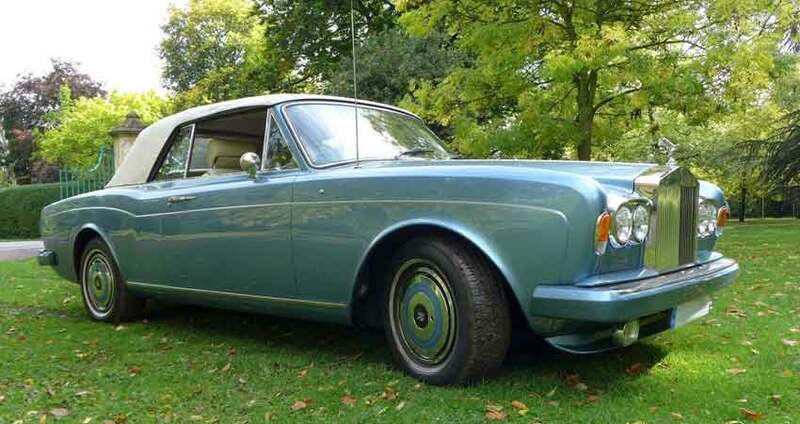 Having even more lavish levels of equipment, the Corniche was a superior car to the saloon on which it was based. 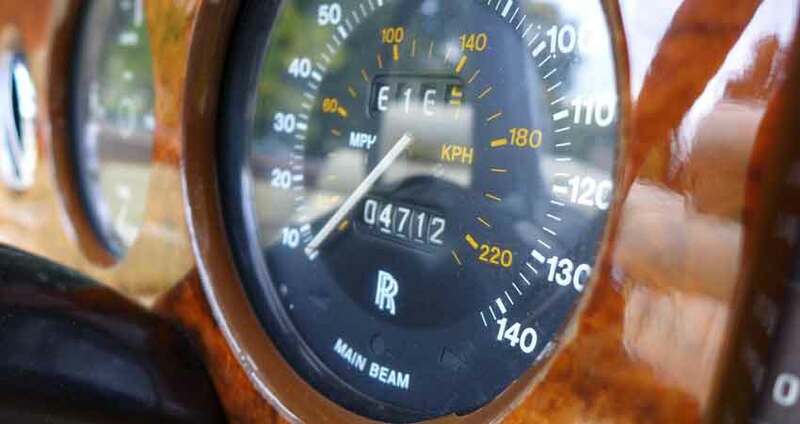 Hand built by Mulliner Park Ward, the Rolls Royce Corniche was Britain’s most expensive car at the time. The price was about half as much again as the Silver Shadow. Only the very finest materials were used including Wilton carpeting, Connolly hide and the best burr walnut veneers. Each car is said to have taken some six months to produce. The result was a level of quality and opulence that surpassed that of the saloons. 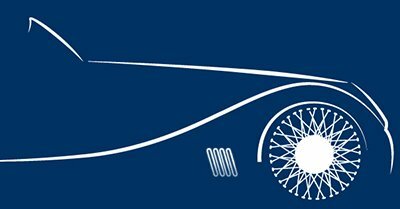 Our Rolls Royce hire car is, of course, adorned by the famous Rolls Royce ‘Spirit of Ecstasy bonnet ornament, one of the most well-known motor car mascots in the world. The inspiration for this mascot was said to be a beautiful young woman who did not have the social status which might have permitted her to marry the man (Lord Montagu) with whom she had fallen in love. The Rolls-Royce Corniche was produced in both coupé and convertible form from 1971 to 1995. The name ‘Corniche’ stems from the originally French and Italian term for a coastal road, especially along the face of a cliff. It was designed by John Blatchley, who also worked on the Silver Shadow, Silver Cloud and Bentley R-type. The Corniche was an exclusive car, with only 1,090 coupes and 3,239 convertibles being made before the Corniche II commenced production in 1988. The Corniche convertible was a massive hit, and was bought by the rich and famous. Celebrities such as Paul McCartney, David Bowie, Tom Jones and Frank Sinatra all owned one. According to The Classic Car Show it is ‘one of the sexiest classic convertibles around. Our Rolls Royce hire car is available for collection in Leeds, West Yorkshire. Our location is within easy reach of all the major towns and cities in the north of England. 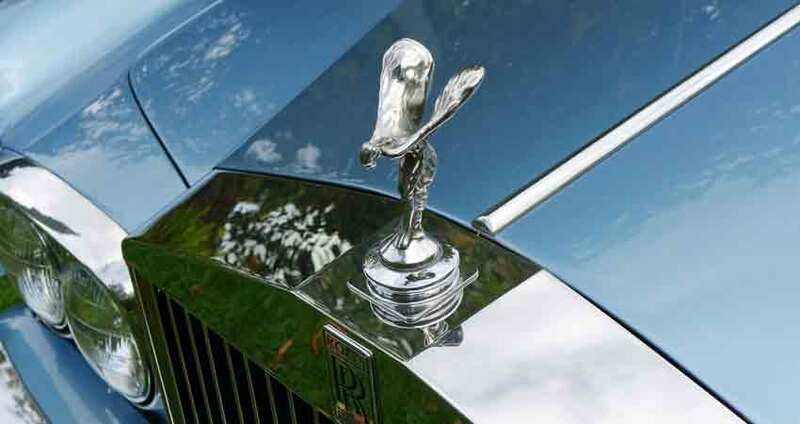 We are in an ideal location for Rolls Royce Hire Bradford, Huddersfield, Wakefield, and Harrogate. For Rolls Royce hire Hull, Rotherham, Doncaster and Sheffield, you don’t have too far to travel either. York Rolls Royce hire is within about an hour’s drive of our Leeds base. As are most of the towns in South Yorkshire and North Yorkshire via the M1 or A1(M). Once you’ve collected it you can drive our Rolls Royce hire car anywhere in the UK subject to our terms and conditions.